Earlier this fall, the Graduate Writing Program welcomed back Celeste Lim and Caela Carter, two authors from the New School’s Writing for Children & Young Adults (WFCYA) MFA Program. Attendees listened to the two authors in conversation as they discussed their new middle-grade books, their journeys to publication, and the challenges they faced as writers post-MFA. The panel was moderated by children’s book author and WFCYA Program Coordinator Caron Levis. Caela Carter (class of 2012), is the author of a number of books, including Me, Him, Them and It (Bloosmbury 2014) and My Life with the Liars (Harper 2016). Her publication story is one that many aspiring writers dream of: she finished one manuscript during her first semester in the program, acquired an agent in the second, and got her first book deal in the summer before her second year. Like Carter, Celeste Lim’s (class of 2014) road to publication began while she was an MFA student. Her debut novel was acquired after attending a master class on cross-cultural writing and diversity in children’s literature at The New School. The class was taught by Scholastic Vice-President and Editor-at-Large Andrea Davis Pinkney, who encouraged Lim to continue writing her story set in medieval China, about a young girl who was sold as a maidservant and child bride to a three-year-old boy. Lim shared that she worked on that story for her creative thesis, and that she spent the next three years working on the manuscript in order to get it ready for publication. That work became her debut novel The Crystal Ribbon, published by Scholastic in 2017, and edited by Pinkney herself. Though both authors’ first publications came easier than most, both Carter and Lim were candid about the challenges they faced in writing their novels. Carter’s latest book, titled Forever or a Long, Long Time (Harper 2017), centers around two newly-adopted siblings who are trying to fill the gaps in their history after years of being in the foster-care system. The writing of this story was more personal for Carter – she was writing a book about foster children while in the process of becoming a foster parent herself. But it was the difference in authorial perspective which challenged her the most. There was a distance in writing the first draft (prior to becoming a foster parent) that she did not have when she began the revision process as a new foster parent. For Lim, the biggest challenge was switching the story from third person to first person narration, upon the suggestion of her editor. Such a huge change would have been a challenge for any writer, but for Lim, for whom English is a second language, the task was even harder. She related how the experience was akin to rewriting the whole book, and how she struggled with writing in first person because of her uncertainty about the colloquialisms and slang she had her characters use in her work. Lim discussed too how working with an editor changed her story for the better. Upon Pinkney’s advice, she managed to trim the original manuscript from 90,000 words down to 70,000. “Andrea thought the story started after 100 pages in,” she said. And that was not the only big change that Pinkney asked her to make. “It became more of a personal story for (the main character) Jing rather than about all the magical things that happened to her,” she added. It bears mentioning that Lim was an international student at the time, and was grappling with concerns about her visa, and with the weight of expectations from her family back home in Malaysia, apart from revising the book. Lim was fueled by more than just motivation. “The key to my success was desperation,” she shared. She jumped on every opportunity to network that the school provided in order to give her manuscript the biggest chance at success. The authors discussed whether or not writers had a responsibility to protect young readers from difficult themes and storylines. “In children’s literature, there is this notion of protecting the reader – letting them know that it will be okay in the end, particularly if the work in question is difficult, said Levis. Lim, whose main character in The Crystal Ribbon was sold into servitude, said that she believed young readers had their own instincts for self-protection when encountering difficult themes. “If they understand it, they’ll understand it in their own way – they’ll protect themselves,” she added. Carter approached this issue in a different way: in Forever, or a Long, Long Time, her protagonists found their forever home at the beginning of the story rather than at the end. She structured her book this way to reassure the reader of a happy ending, in spite of the difficult pages ahead. Done that way, her reader is made to focus on the payoff for the characters, rather than on the obstacles they face along the way. “The quest is about who loved them, not who abandoned them,” Levis added. There was a strong sense of kinship that filled the room during the intimate event. The panel was well-attended not just by current students of the writing program, but by alumni who came to support the returning authors as well. In this conversation about finding family in their respective books, they shared about the family they found through the program. Author and faculty member Sarah Weeks captured the sentiment of the evening when she asked the authors this final question: What have you taken with you from this program that you’re using now? For both authors, the answer was easy – they agreed that it was the people they left with, that even though a structured group dynamic might not last, they would always have people to share pages and thoughts with. “They’re not just writing partners, they’re a lot more now,” Lim said. MFA student Julia Lynn Rubin showed up at The New School in the fall of 2015 with one book written, one in the process of being written and an idea for a third. A student in the Writing for Children and Young Adults program, once she began the program, she hit the ground running with her writing. I recently had the opportunity to sit down with Rubin over sushi where she introduced me to edamame and entertained me with her bubbly personality. Kelly McHugh-Stewart: First off, congratulations on selling your book! I’ve been dying to hear about it. Can you share a little of it with me? Julia Lynn Rubin: Thanks! It’s called Burro Hills, a fictional town in southern California on the outskirts of LA. It’s a gritty LGBT YA novel that I started writing in college. I had no idea it was going to be a novel, it was just a series of vignettes then. It was a hot mess for years. I wasn’t sure how to write a novel, and I had so much trouble finishing it because I was working, but I finally decided to go to grad school and finish it. KMS: Where did you get the inspiration for Burro Hills? JLR: I just had these characters in my head. I’ve always been fascinated by the West, the climate and the culture. The two books I’ve written both take place out West. I’m fascinated with southern California for some reason, and urban sprawl. So I just had these ideas and pictures in my head. I went from there and the characters just kind of took on a life of their own. The book isn’t autobiographical, but it’s based on emotional experiences that I’ve had. The main character is a gay teen boy, I don’t know what that’s like, but I sort of based my own emotional experiences on his, so I feel very connected to that character. I care about my characters a lot. They feel real to me. I’m also fascinated with toxic masculinity and how it affects boys. I really wanted to write a very non-stereotypical gay character who was dealing with social pressure. I wanted to show a very non-stereotypical character and wanted to make him very real and have very non-stereotypical experiences. KMS: Do you feel there’s a need for more representation of LGBT characters in YA literature? JLR: There are definitely LGBT books, but there can always be more. There’s a lot of great LGBT YA that’s coming out and doing really well, but it’s still under represented. It’s still mostly straight characters and mostly straight romances. KMS: You said you base your characters on your own emotional experiences, is that a difficult way to write? JLR: It’s an emotionally charged book, and I put a lot of my own emotion into it. I was with my characters. My best stuff was the stuff where, even though I wasn’t necessarily writing about actual stuff that happened to me, I was basing my writing on a feeling I had. I would fictionalize that feeling and write a scene, and that was really cathartic. It’s a very personal book even though it’s not necessarily about me, if that makes sense. I really relate to all the characters. They all have an element of me in them. KMS: How did it feel when you went under contract with your book earlier this year? JLR: I was scared when I signed, but I trusted my agent and really trusted the publisher after talking to my editor. Publishing is scary because there are a lot of unknowns. I was excited, but it was also like now what? It’s funny because you think when it happens there are going to be balloons everywhere and these magical gates open, but then your life is kind of the same. KMS: Tell me a little about Diversion Books. JLR: They’re an indie publisher in New York. They started out in 2010 as an ePublisher but they’ve expanded and have grown a lot. They published Mark Cuban’s eBook, How to Win at the Sport of Business, and now they’re doing print titles. So they’re doing well. My agent had another YA book that she sold to them that has been doing really well, and she thought it would be a good spot for me. So far my editor is really nice and she loves the book. The whole team is really behind it. They’re not a Big Five, they don’t have tons of money and I’m not a celebrity release, but at the same time I think one of the benefits of a small pub is that you get a lot of personalized attention and they really care about your book. They really want to help you succeed. KMS: How has the Creative Writing Program helped you in your writing? JLR: I think the most helpful thing for me has been the sense of community and feeling that, as a writer, I have a place. I have friends, I have people I can talk to, I have professors; it’s a great network. I know I’ve improved as a writer, but I think mostly my confidence has improved. Before, writing was something I just did on my own, but now I have friends who are also serious about it, so it’s definitely been helpful that way. KMS: The Writing for Children and Young Adults program seems like a pretty close-knit group. Have you enjoyed being a part of it? JLR: We are. We’re a really close group and it’s non competitive and supportive. We’ve had every workshop with the same people, more or less, so that’s been very helpful. We’ve really gotten to know each other’s writing. I know everyone’s style and they know mine. I attribute how most of my second book turned out to my classmates, actually. Plus, they’ve become come of my closest friends as well, so it’s been really great. Julia Lynn Rubin lives the writer's life in Brooklyn, where she is currently pursuing an MFA in Writing for Children & Young Adults at The New School and is set to graduate in May 2017. She earned her BA in Anthropology & Film Studies from the University of Pittsburgh. Follow her on Twitter using the handle @julialynnrubin. When New School alumni Alyson Gerber walked back into to her old classroom on West 12th street holding up her new book, Braced, she was standing tall. Ten years before, as a 22-year-old student in Susan Shapiro’s “Writing for NYC Newspapers & Magazines,” she was assigned a “humiliation essay” on her most embarrassing experience. Gerber chronicled having to wear a back brace to treat a severe case of scoliosis from ages 10 to 13. Her piece “I Have Severe Scoliosis, Just Like My Mom” was published in a website called Thefrisky.com and then reprinted in the anthology Chicken Soup for the Soul: The Magic of Mothers & Daughters. Dealing with her disability as an athlete at such a formative age gave Gerber sympathy and sensitivity to working with children with specific needs. She became a teacher. Yet a few years into to her teaching job, Gerber realized writing was really her dream. She returned as a New School MFA graduate student in their Writing for Children program. There she began to explore her experience wearing the brace. It was then she fully realized the level of impact her childhood had on her life –and incorporated the trauma into her art. This led her to Braced, Gerber’s poignant and passionate debut fiction about a young middle school soccer player whose life changes suddenly after discovering that she needs to wear back brace for 23 hours every day. It was recently published by Scholastic, where both her agent and book editor Cheryl Klein also had to wear back braces. The book scored starred reviews from Kirkus and Booklist. At her recent standing room only launch party at McNally Jackson Booksellers, she was interviewed by award-winning author and New School teacher David Levithan. She’s thrilled that he will be editing her next Scholastic novel Focus, about overcoming her A.D.D., coming out in 2018. Now 32, married and living in Brooklyn, Gerber offered advice and inspiration to fellow New School students, proving that writing can be a way to transform your worst experiences into the most beautiful. Iva deMartelly is a writer, activist, and actress in her sophomore year at Eugene Lang. She is majoring in Global Studies, and aspires to one day use acting as a platform to spread awareness for issues that run dear to her heart, specifically women's rights and health. She has written for Elephant Journal and Galore magazine, as well as regularly updating her personal blog. Earlier this winter Writing for Children/YA alumni and students gathered as MFA alumni Jessica Verdi, Julie Sternberg, and Tonya Hegamin generously shared their thoughts, experiences, and tips on creating hope and positive action in the children's literature world, ourselves, our communities, and of course, young readers. Verdi was kind enough to share an excerpt of her inspiring insights from the evening. For me, “hope” is directly linked to another word: Peace. I’ve been thinking a lot lately about the definition of peace, and how it doesn’t always mean the same thing to everyone. For me, peace equals harmony, balance, acceptance. A state where all beings are treated with respect and understanding. And all on a very deep, base level. I know this sounds like an unreachable utopia, and maybe it is, on a grand scale. But I think this sort of peace absolutely exists in smaller pockets, and that it’s our duty to try to make those pockets grow and expand wherever possible. To some others, their definition of peace is silence, non-confrontation, basic civility. But it’s often in these situations that people purposely ignore the ways in which others may be persecuted, or hurting. This is a state where important issues and conversations are swept under the rug, a “you think your way, I’ll think mine, and let’s not discuss it” mentality. On the surface, this does seem to create “peace” in times when there would otherwise be strife or head-butting. But this is also where harm can happen because there’s no room for sharing or understanding, which leads to there being no room for progress and harmony. So, it’s my belief that we need to TALK. We need to share our stories, as often as possible, when it’s safe to do so, because that’s the only way understanding, and a path to real peace, can happen. And, in turn, hope for the future can happen. Starting conversations, and opening a window into the lives of characters living through lesser-discussed realities is what I always try to do in my books, and my small way of creating hope for young readers. I believe that representation in books for young people directly creates hope in two distinct ways. 1. As we all know, it’s very important for kids to see themselves in books. Like adults, kids and teens are living out countless situations every day, and they need to know they’re not alone. That the world sees them. I’m sure we’ve all had moments where we see little bits of our own lives in the books we’re reading, and felt vindicated or understood. Giving young people this opportunity is one of the most important ways we can create hope and confidence for them in their individual lives. 2. It’s also important for young people to read about characters and situations that are different from their own. By allowing them to get inside the head of someone who is dealing with an issue foreign from, but just as real as, their own, we’re giving those young people the chance to develop empathy and compassion. This is a huge step on the way to that “idyllic” kind of peace, and an important means of creating hope for all our futures. I write contemporary YA, and while I have personal insights on the subjects I write about, I am by no means the authority on any of them—or any subject at all, for that matter. And there are many other subjects that I don’t have personal insights on and therefore wouldn’t feel comfortable tackling. That’s why this community of children’s book authors is SO crucial. There can never be enough talking. There can never be enough books. There can never be enough perspectives. No story is ever a complete view of the subjects or themes it’s tackling. We all need to keep going, keep writing, keep fighting, keep doing our small parts. Jessica Verdi is the author of several contemporary novels for young adults, including What You Left Behind, The Summer I Wasn't Me, My Life After Now, and an upcoming untitled novel from Scholastic. She received her MFA in Writing for Children from The New School in 2012 and is a Senior Editor at Crimson Romance, Simon & Schuster's digital romance imprint. 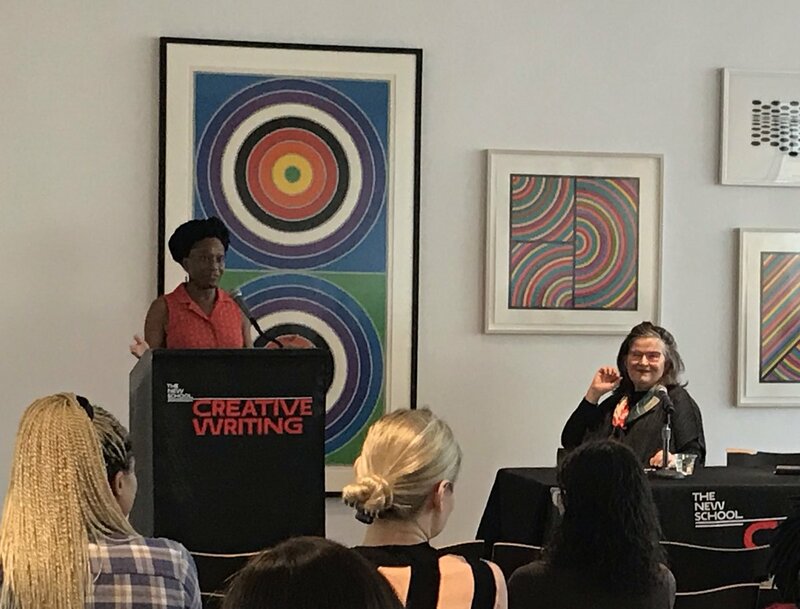 Earlier this month The MFA in Creative Writing Program at The New School and the New York Metro Chapter of SCBWI came together to offer the third annual Society of Children’s Book Writers and Illustrators Agent Panel. Seasoned agents Linda Camacho of Prospect Agency, Susan Hawk of The Bent Agency and Andrea Somberg of Harvey Klinger, Inc., along with moderator Adria Quinones spent the evening sharing advice with the Writing for Children and Young Adults community. From tips on how to write a good query letter to tips on how to celebrate diversity in children’s books, the Agents Panel was one of many useful opportunities the recent partnership between the Creative Writing Program and SCBWI provides MFA Students. This unique partnership stems from MFA alumni Caron Levis, Writing for Children and Young Adults MFA program coordinator at The New School, and Kristi Olson, SCBWI Metro New York Assistant Regional Advisor. Levis and Olson have created a strong bond between the two entities that spans more than just the annual agents panel. The two have worked together to help connect MFA students with SCBWI, providing these students an inside look into the children's book community. “It was great returning to The New School as a proud Writing for Children MFA alum and SCBWI Assistant Regional Advisor,” said Olson. “I truly loved every moment of my time as a student in the MFA program and am excited that we've joined forces - kudos to Caron Levis! When I was a student some of my classmates hadn't even heard of SCBWI which is surprising since it's the No. 1 professional organization for children's writers. Like Olson, Levis is glad the two forces have combined and is excited to see how this partnership continues to grow in the future. "Bridget Casey (SCBWI Metro New York Co-Regional Advisor), Pat Weissner (SCBWI Metro New York Co-Regional Advisor), Kristi Olson and the rest of the SCBWI Metro team do so much for the local children's literature community," explained Levis. "It's been an honor to work with them and is always terrific to get a dose of their energy." Guest post by Alison Doherty and Kristina Forest, both second-year students in The New School’s Writing for Children and Young Adults MFA program. We need diverse books. But who should write them? Last week, this question began the Writing for Children discussion with We Need Diverse Books, featuring Una LaMarche and Daniel José Older and moderated by New School alum Sona Charaipotra. LaMarche admitted that it depends on who you ask and that, “the answers are never clear.” Older echoed her feelings, but added, “You can’t write without writing the other.” He went on to describe how every writer has a file cabinet. The files are experiences, memories, places, books, and people. And these file cabinets, especially in New York City, are rarely monolithic. So who should write diverse books? The answer for some authors will be not me or not yet. And that’s okay. There are other ways to support the diverse books movement besides writing cross-culturally. The job of white writers, for example, might not be to write outside their race. Sometimes it can be more important to step out of the way and raise up the voices of other authors. Always, it is important to listen. “Listening is one of the lost arts to writing,” said Older. The panel agreed that friendship, conversations, and “soul work” could be more important research than sources easily found in a library or online. In the children’s writing community, by now many of us know that the statistics on diverse books are grim. Studies show that little more than 10% of children’s books feature characters of color. LGBTQ characters and characters with disabilities are even more rare. And negative tropes or overdone clichés make up many of the representations that do make it onto bookshelves in into children’s hands. The panel also stressed that much of the responsibility for fixing these problems lies with changes needed in the publishing industry and with other gatekeepers. It can be hard to balance the social responsibility of being an artist with the knowledge that problem of diverse book scarcity extends far beyond the mistakes or greatness of any single book or author. But change is rarely easy. And, as we’ve learned through the writing and rewriting and rewriting that go hand in hand with workshop, writing is rarely easy either. To learn more and stay up to date on these issues follow @diversebooks on twitter and check out the hashtag #ownvoices.